Omnitec has over 20 years of experience in the manufacture and deployment of portable air filtration equipment to a wide range of applications in medical facilities, laboratory environments, and hazardous waste control. Our line of OmniAire and OmniAire PAC HEPA air filtration machines with airflows from 350 cfm to 2000 cfm, we can help you to solve almost any air purification issues. HEPA filtration of hazardous contaminants from flow benches with sealed HEPA for ease of disposal. To assure that diseases do not spread, the potential problem areas should be isolated and the air purified by portable HEPA air filtration equipment as recommended by the Center for Disease Control (CDC). The studies show that the combination of HEPA filtration with UV germicidal irradiation (UVGI) is the most effective method to capture and destroy bio-contaminants, such as the fungi, bacteria and viruses that spread diseases such as pandemic flu, avian flu, tuberculosis, aspergillosis, ebola fever, marburg hemorrhagic fever, lassa fever, and other biological threats. The OmniAire PAC machines, combining HEPA/UVGI lights is designed for patient’s isolation rooms, waiting areas, operation rooms and other highly sensitive areas. The UVGI irradiation deactivates and kills bio-contaminants which are than captured in a HEPA filter. 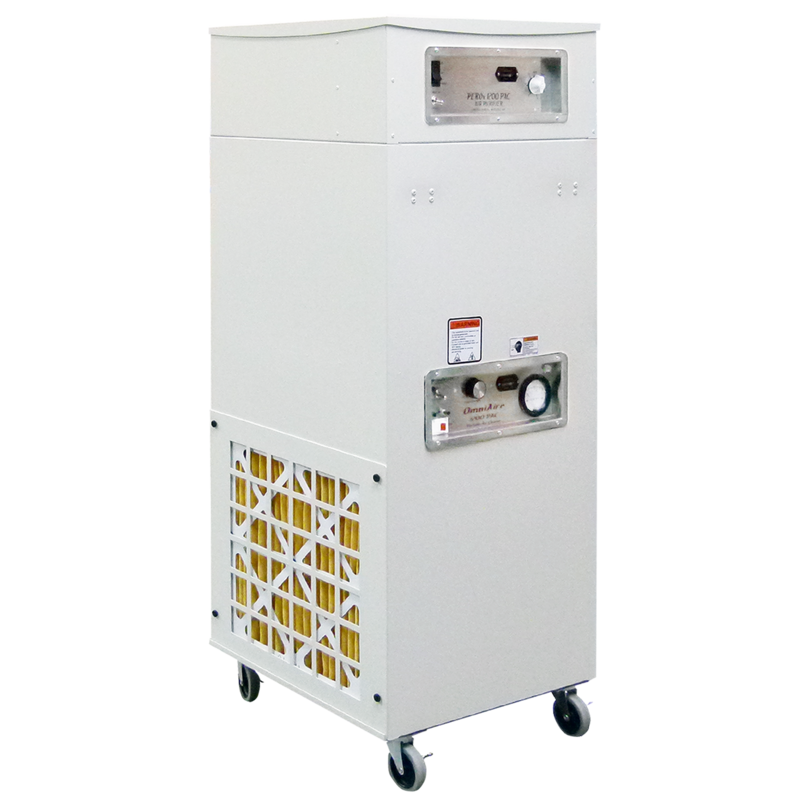 HEPA filtered air can be exhausted or farther sanitized by an optional PEROx module with Hydro-peroxide purifier. The exhausted sanitized air carries additional Ionized-Hydro-Peroxide molecules to sanitize air and surfaces in surrounding area. Omnitec’s customer support can help you to select the appropriate HEPA air filtration system for your application to help reduce exposure to airborne pathogens associated with hospital acquired infections. What is special about OmniAire PAC HEPA Air Purifiers? OmniAire PAC are design for use in medical environment and labs, where removal of aerosolized sub-micron particulate and pathogens is critical. HEPA air purifiers used in healthcare facilities provide continuous air purification and required air changes per hour (ACH). Our PAC machines are used to create isolation rooms with negative pressure (AII) or positive pressure (PE). They could be also connected to anteroom for operating rooms or portable isolation enclosures. OmniAire PAC air purifiers use certified HEPA filter 99.99% @0.3 micron efficiency and UV-C germicidal lights (UVGI) to comply and exceed 2003 CDC Guidelines for Environmental Infection Control in Health-Care Facilities. How to monitor the differential pressure? The room pressure for AII or PE is 0.01 to 0.03”WC in reference to corridors. 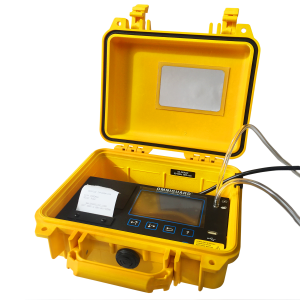 This is a very low pressure range and requires high accuracy instrument. We have available OmniGuard 4 pressure recorder or the Watchman pressure monitor. How We Benefit From Using PAC machines for Patient Room Cleanup? Turnaround Time – We are concerned with providing the highest levels of protection for hospital workers and patients. After hospital cleaning staff carry out infectious disease control cleanup procedures (the removal of all physical items) in the infected areas, the room can then be put back in service faster if the air is purified and sterilized using an OmniAire PAC with PEROx air purifier module. This results in minimal room shut down and disruption which is a major concern for all hospital administrations. Which OmniAire PAC model would be the best for our facility? OmniAire PAC air purifiers are available with air flow capacities 200 to 1100 and 300 to 1850 cfm. Both models are capable to provide a wide range of air flow set by variable speed controller to meet your 12 ACH requirements. These portable machines with casters or larger set of wheels are easy to move from room to room as needed. How many PAC machines it would require to have 12 ACH flow rate? CDC guidelines for isolation rooms requires 12 ACH air flow rate or more in isolation rooms (PE or AII) .After calculating cubic feet of the room (length x width x height) multiplied by 12 (ACH) calculates minimum required airflow of cubic feet per hour. 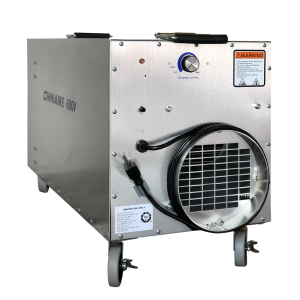 This divided by 60 (minutes gives you required air flow of cubic feet per minute (cfm) Our Airflow Calculator will quickly assists you with this calculation end the cfm required.. If this airflow calculation is for example up to 800 cfm, choose equipment which is rated to deliver about 1600 cfm. This takes in consideration leakage of air into the room, machine running at less then full speed and gradual loading of filters with dust. Larger safety margin is better. 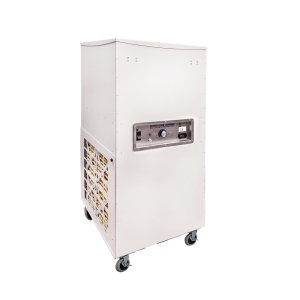 For a requirement of 400 to 600 cfm, the OmniAire 1200PAC with 1100 cfm maximum airflow would be right size of the machine… When switching patients in a room, how long should we run the PAC HEPA system between the patients? When changing patients in a room, it is recommended by CDC to run our PAC machine with at least 99.97% HEPA for 30- 40 minutes at rate of 12 ACH per hour. Adding additional time or higher air flow adds safety. Adding PEROx Air Porifier Modole with Hydro-Peroxide generator would shorten your turnover time and increase safety for patients and the nurses. Are all HEPA filters the same quality? Only individually tested and certified HEPA filters should be used in critical medical applications. All HEPA filters used in OmniAire PAC machines are individually tested and certified for 99.99% efficiency at 0.3 micron, exceeding CDC recommendations. How often should we change primary and HEPA filter? It depends on the environment, type of dust and other contaminants. In hospital environment, the primary pleated filter is usually replaced every two months when machine is used or when put in storage for extended time. HEPA filters are usually changed every 12 to 24 months, depending on the environment. Pressure gauge on the PAC machine provides good indication of filters loading . Consult Operators Manual for recommended filters changes based on pressure readings. How UV-C germicidal lights help to control virus and bacteria? The CDC recommends UV-C germicidal lights for destroying viruses such as Tuberculosis. UV-C wavelength destroy bio-contaminants by penetrating the cell’s membrane destroying the cell’s DNA HEPA filter which is downstream from the UV light, captures all live and dead virus cells and the UV-C germicidal lights continuously irradiate the HEPA surface provide additional safety against biological contaminants. How long the UVGI lights last? UVGI lights life span is measured in hours they operate. All UV lights slowly degrade in their power output. Our UVGI lights should be replaced after 15,000 hours, which is close to 2 years of nonstop operation and the lights have only 75% of their initial intensity. How PEROx Air Purifier module works? PEROx purification process utilizes Ionized-Hydro-Peroxides™, friendly oxidizer plasma, made from oxygen and humidity. Hydro-peroxides rapidly destroy bacteria, virus, VOCs and odors passing thru our unit and continue to seek contaminants in surrounding air and on all the surfaces. The lifespan of these oxides is about 15 minutes after which the unused oxides convert back to H2O and O2. and is safe for a human exposure. This powerful and safe purification process can be added to our portable HEPA air scrubbers when needed. See more on PEROx module and how effective is Hydro-Peroxide on MRSA, Bird Flu and similar dangerous virus and bacteria.